I recently restored a 1962 Gary and it reminded me that there is an earlier model with the same name that i used to have. It was a 1951 Gary and it was produced for three years. The Gary came in a yellow 10K gold filled case with a two-tone finished sterling silver dial with 18K gold numerals and dots. 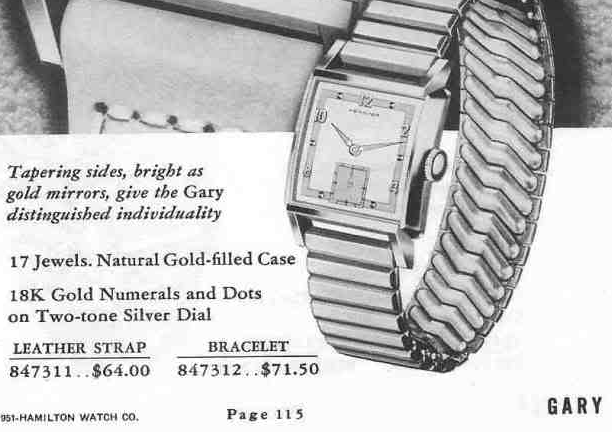 As you can see in the two ads, the Gary was offered on two different styles of bracelets - so if you find one with a bracelet it might be original. Behind the dial is an 8/0 size 17 jewel 747 movement. 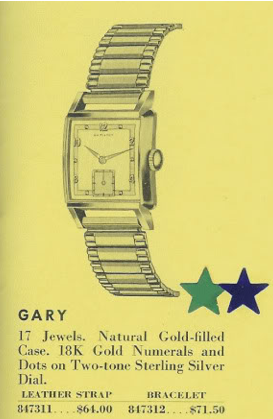 I think the Gary is easily confused with the 1953 Ryan although the Gary only came in yellow with a white / butler dial while the Ryan came in yellow or white gold filled with two-tone white or black dial. They are about the same size and look very similar thanks to their square bezel opening and numeral / dot dial - albeit the Ryan has roman numerals. I just aquired a Gary that appears to be made between 47 and 49. Do all of these watches come with 18k numerals and dots? Mine has the gold filled case and looks identical to the one in the picture. My serial number is y434919. Thanks so much for this site! 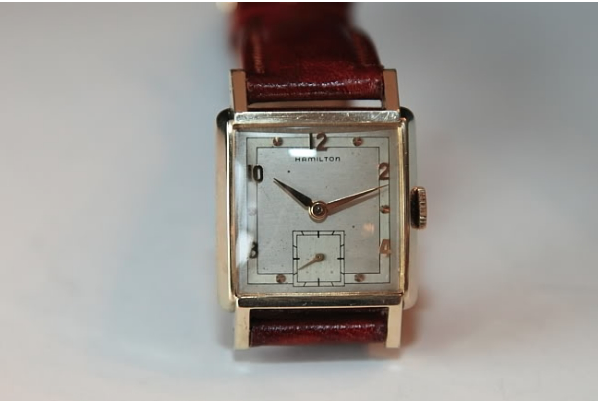 I found a Hamilton my grandfather wore every day, and it appears to be a Gary, and with what also seems to be an original band. This page made it quite easy to get some valuable additional information about the piece! Thanks!